Tata Motors today announced the signing of a Memorandum of Understanding (MoU) for a long-term partnership with Volkswagen Group and Skoda, to explore strategic alliance opportunity for joint development of products. 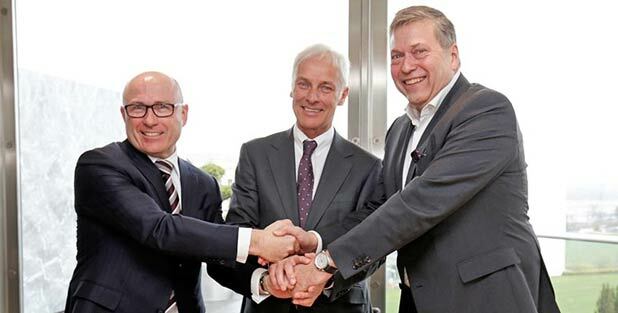 The agreement has been signed by Guenter Butschek, CEO & MD of Tata Motors, Matthias Mueller, CEO of Volkswagen AG and Bernhard Maier, CEO of Skoda Auto. The document lays down the scope and objectives in order to reach agreement on the modalities and terms of a long-term cooperation in identified areas of partnership. Skoda Auto will take the lead on behalf of the Volkswagen Group to drive forward work towards development of vehicle concepts in the economy segment. Announcing this strategic alliance opportunity, Guenter Butschek, CEO and Managing Director, Tata Motors, said, "We are delighted to announce our potential cooperation with Volkswagen Group and Skoda. We strongly believe that both the companies, by working together, can leverage from each other’s strengths to create synergies and develop smart innovative solutions for the Indian and overseas market. This is in alignment with Tata Motors’ efforts to make itself ‘FutuReady’ by embracing new technologies, fostering higher platform efficiency and offering solutions that connect with the aspirations of our customers." "Our aim with the envisaged strategic partnership with Tata Motors is to lay the foundations in the Group and the brands that will enable us to offer customer-oriented mobility solutions in the emerging, fast-growing automobile markets, as elsewhere. By offering the appropriate products, we intend to achieve sustainable and profitable growth in very different parts of the world. That is why we are systematically pursuing our regional growth strategy", Matthias Müller, CEO of Volkswagen AG, commented. "We are looking forward to the joint project with Tata Motors. Delegating project responsibility to ŠKODA underscores the great confidence of the Volkswagen Group in the ability of our brand. Together with Tata we will be specifying the concrete opportunities for collaboration over the coming months", Bernhard Maier, CEO of ŠKODA Auto, stated. Tata Motors and SKODA Auto, representing the Volkswagen Group, will detail out the guiding principles and terms of cooperation in the next few months. Post successful completion of definitive agreements, the two companies will start joint development work and joint value-chain activities. Based on this joint work, Tata Motors plans to launch products in the Indian market, starting calendar year 2019. Tata Motors Limited is India’s largest automobile company, with consolidated revenues of INR 2, 75, 561 crores (USD 41.6 billion) in 2015-16. Through subsidiaries and associate companies, Tata Motors has operations in the UK, South Korea, Thailand, South Africa and Indonesia. Among them is Jaguar Land Rover, the business comprising the two iconic British brands. It also has an industrial joint venture with Fiat in India. With over 9 million Tata vehicles plying in India, Tata Motors is the country’s market leader in commercial vehicles and among the top in passenger vehicles. Tata cars, buses and trucks are being marketed in several countries in Europe, Africa, the Middle East, South Asia, South East Asia, South America, Australia, CIS and Russia. The Volkswagen Group with its headquarters in Wolfsburg is one of the world’s leading automobile manufacturers and the largest carmaker in Europe. The Group comprises twelve brands from seven European countries: Volkswagen Passenger Cars, Audi, SEAT, ŠKODA, Bentley, Bugatti, Lamborghini, Porsche, Ducati, Volkswagen Commercial Vehicles, Scania and MAN. The Group operates 120 production plants in 20 European countries and a further 11 countries in the Americas, Asia and Africa. Every weekday, over 610,000 employees worldwide produce nearly 42,000 vehicles, and work in vehicle-related services or other fields of business. The Volkswagen Group sells its vehicles in 153 countries. With its "TOGETHER – Strategy 2025" future program, the Volkswagen Group is paving the way for the biggest change process in its history: the realignment to become a globally leading provider of sustainable mobility. Tata Motors Group global wholesales at 145,459 in ..
Tata Motors’ introduces ‘SAMARTH’ ..
Tata Motors along with Jaika Motors to introduce t ..
Tata Motors domestic sales record 16% growth in FY ..